On the eve of their 50th Anniversary return to the Royal Opera House in London, the Bolshoi Ballet’s creative director Sergei Filin seemed highly defensive of the company’s reputation when interviewed in last week’s Telegraph. In the fiercely protective ballet world this intense loyalty and pride is unsurprising. However, it was only six months ago that Filin was attacked with a mixture of urine and battery acid outside his Russian home at the orders of a Bolshoi dancer and so one might expect his loyalty to have been tested. The attack left Filin blind in one eye, with only 10% vision in the other, and requiring a skin graft where flesh from the back of his left arm was used to treat the worst of the damage to his face (he has so far had to have 22 surgical procedures.) The tragic attack on this former principal dancer shocked the world, horrifying the public and sending the media and ballet worlds into a frenzy of gossip and accusations- the Bolshoi being a company famous for the ruthless competition between its artists. Historically, dancers were rumoured to leave crushed glass in other dancer’s ballet shoes, or needles in their costumes. However, the almost trite stereotype of the sociopathic and jealous ballet world, pirouetting around a quest for physical perfection, had not ever been so brutally real as in the wake of the attack on Filin, when Bolshoi dancer Pavel Dmitrichenko was charged with having hired the attack. As if by some tragic irony, Dmitrichenko was a dancer famous within the company for his portrayal of villainous roles such as Ivan the Terrible and the evil sorcerer in Swan Lake. As the full context of the attack was revealed, huge cracks seemed to appear in the famously polished- in fact, perfect- veneer of the Bolshoi. It would turn out that the acid assault had merely been the climax in a campaign of abuse and threats lasting months, including spam phone calls, the slashing of Filin’s car tyres and the hacking of his e-mail. Dmitrichenko claimed that- incensed by poor pay and his girlfriend, fellow ballet dancer Anzhelina Vorontsova, not receiving better roles- he had ordered an ex-con to ‘only’ beat up Filin, not to attack him with acid. 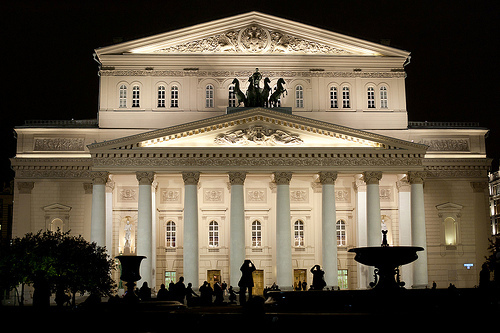 Since the attack, the Bolshoi has continued to be marred by scandal, seemingly unable to pick itself up from Filin’s tragedy despite the best efforts of its directors (and the Russian Ministry of Culture) to gloss over the apparent in-fighting. Dancer Nikolai Tsiskaridze, a Bolshoi veteran, was forced to leave the company in June and Svetlana Lunkina, once a leading soloist with the company, moved to Canada this year, telling Russian media sources that her husband had been receiving threats. The Russian Ministry of Culture fired Anatoly Iksanov, the Director of the Bolshoi, a year before his contract was due to end, accusing him of mismanagement surrounding the Bolshoi’s renovation (worth £860 million.) And then a veteran violinist with the company fell into the orchestra pit from the stage and died only three weeks ago. Surely somewhere in Hollywood a screenwriter is frantically trying to cram all these plot twists into a single script- the story really writes itself. After all this, what remains must be the ballet- that medium with which the Bolshoi has so long captured the imagination of the world. Vladimir Urin, the company’s latest director, seems to agree with Filin’s sentiment, telling the BBC that “what is vitally important now for the people of the theatre is what they will see on stage.” And so all eyes have descended upon the Royal Opera House, where the Bolshoi returns this summer for a three-week season marking the 50th anniversary of their first performance at the ROH. Unsurprisingly, they have brought the ballet big guns, fantastical productions including The Sleeping Beauty, La Bayedère and Swan Lake. These iconic shows will surely play into the perfection and imagination- both physical and aesthetic- for which the Bolshoi is so legendary. From choreography to costume, these ballets all serve to reflect the finer history of the Bolshoi, and of Russian ballet. As if looking to directors of the past for the guidance they so desperately need, we can see the expressive intensity of Gorsky and even the decadent spectacle made famous by Diaghilev’s Ballets Russes. In this vein, their rendition of George Balanchine’s Jewels– inspired by and including the diamonds of Van Cleef and Arpels- will be a glittering performance in both a literal and metaphorical sense. What the Bolshoi has on their side is that the ballet world is behind them, waiting eagerly for the company to reaffirm its prestigious place in the history books. The company has put together a programme designed to thrill and unsurprisingly every performance is sold-out, with wide media coverage and unusual access behind the scenes. Last week Mr. Urin told the BBC, “I’m sure that all these events which happened in the life of the Bolshoi and which amazed all the world – all these things are now in the past.” It would appear that for this grand return to Covent Garden, the Bolshoi cannot afford for anything to go wrong.